With shared interests and experiences, Japan-Ukraine relations should be booming. Why aren’t they? In June 2015, Shinzo Abe became the first Japanese prime minister to visit Ukraine since its independence in 1991. Many observers hoped his visit was a turning point lifting Ukraine-Japan relations to a higher level. Upon Japan’s invitation, the president of Ukraine, Petro Poroshenko, paid a reciprocal visit to Japan from April 5 to 7 this year. During his stay, Poroshenko met with Abe, Speaker of the House of Representatives of the National Diet Tadamori Oshima, and representatives of the Keidanren (Japan Business Federation). No declarations or other bilateral documents were signed. According to the press releases from both administrations, Poroshenko and Abe discussed mainly the 30th anniversary and 5th anniversaries, respectively, of the nuclear disasters at Chernobyl and Fukushima. They also discussed international affairs. Abe mentioned that, as Japan chairs G7 this year, he intends to put the Ukraine situation on the agenda of the summit that will take place in Mie prefecture on May 26-27, 2016. He also made it clear that Japan will realize existing Official Development Assistance (ODA) projects and start new ones only on the condition of internal reforms in Ukraine. During the meeting with Tadamori Oshima, Poroshenko expressed his gratitude to Japan for its support of Ukraine’s territorial integrity and sovereignty, as well as its decision to impose sanctions on Russia for the annexation of Crimea. While meeting with the Japanese business representative, Poroshenko invited Japanese companies to invest in Ukraine and to take part in the privatization of Ukrainian ports and energy sector facilities. Truth be told, on the surface the visit yielded little results. Most likely, it is a reflection of Ukraine’s internal situation: a protracted political crisis as well as suspended cooperation with the IMF due to a lack of reforms, especially when it comes to combating corruption. Moreover, leaked documents from the Panamanian law firm Mossack Fonseca suggest that Poroshenko attempted to use an offshore company for a pre-sale restructuring of his business. Ukrainian prosecution officials said there was no evidence of a crime, yet the incident did not go unnoticed in Ukraine as well as abroad. All these factors help undermine Ukraine-Japan bilateral relations. Since establishing diplomatic relations with Ukraine in 1992, Japan has been always supportive of projects addressing the consequences of the Chernobyl nuclear disaster. In 2011, after the Fukushima nuclear disaster, Ukraine and Japan were united in their experience of suffering from such nuclear catastrophes. Territorial disputes with Russia provide more common ground. Japan is claiming its rights to the so-called Northern Territories, which have been occupied by Russia since World War II. Ukraine is struggling to restore its territorial integrity and sovereignty after Russia annexed Crimea in March 2014 and continues to back military separatists in eastern Ukraine (Donbass). In the economic arena, Japan sees great potential in Ukraine. Kyiv is close to the EU, one of the major markets for Japanese products, and as of January 1, 2016 enjoys a Deep and Comprehensive Free Trade Area (DCFTA) with the EU. Ukraine, however, boasts a population of 43 million with qualified workers and managers available at lower wages than in the EU. Ukraine also neighbors non-EU members Moldova, Belarus, and Russia by land, as well as Turkey and Georgia by the sea. The European Union is an important market for Japan. According to Japan External Trade Organization (JETRO), in 2015, Japanese export in goods to the EU were worth $66 billion, 11 percent of its total exports. However, negotiations over a Japan-EU free trade agreement – ongoing since 2013 – have hit roadblocks, and are unlikely to see progress for at least the next two to three years. Under these circumstances, in addition to its advantageous geographic location, the DCFTA between Ukraine and the EU is another strong motivator for Japanese companies to move their production sites to Ukrainian territory. Ukraine’s infrastructure is well established but needs modernizing. Japan is already helping via its ODA projects. Since March 2014, Japan has announced assistance amounting to approximately $1.85 billion. In total, as of January 2016, Japan had granted to Ukraine $3.1 billion in loan aid, grant aid, financial assistance, and technical cooperation. That includes a $1.1 billion ODA loan to modernize the Bortnychi sewage plant, which treats the sewage for 3 million people in Kyiv and the surrounding small towns. The other promising and large project deals with improving the energy efficiency of coal power plants in Ukraine. According to Bno-Airiian, the head of the European Integration Department at the Ministry of Energy and Coal Industry of Ukraine, Japan is planning to install for free a $30 million steam turbine at Trypilska thermal power plant. In addition, Ukraine and Japan have defined potential projects that can be realized in the near future: the joint production of locomotives in Ukraine, bridge construction across the river Pivdennyi Buh in Mykoliav city, a bypass road around Kyiv, and construction of a metro line to a heavily populated Kyiv district. In January 2011, then-Ukrainian President Viktor Yanykovych visited Japan. During the negotiations with then-Prime Minister of Japan Naoto Kan it was decided to negotiate an agreement on promotion and protection of investments. The Agreement between Ukraine and Japan for the Promotion and Protection of Investment was signed on February 5, 2015 and entered into force on November 27, 2015. Its purpose is to improve the legal stability of the investment environment in Ukraine. The Japanese MOFA emphasized that “the agreement is based on the strong demand of Japanese companies.” According to the ambassador of Japan in Ukraine, Shigeki Sumi, the Japanese business community is interested in Ukraine due to its geographic and cost advantages. Presently, Ukraine has received $130 million in Japanese FDI.Yet, taking into account the investments made by the affiliates of Japanese companies in Europe, the amount of FDI is significantly higher. For instance, the Germany-based affiliate Yazaki Europe Limited established Yazaki Ukraine to produce electric products for automotive industry in 2002; the total amount of investments was $32 million. In 2015 Fujikura Automotive Europe, headquartered in Spain, decided to invest $75 million in Ukraine to construct a plant for automotive components. It will employ 3,000 people. Despite the positive economic signs noted above, Poroshenko’s visit to Japan lacked grand vision and was undermined by internal political crises and the absence of efficient internal reforms in Ukraine. The Ukraine-Japan relationship has yet to realize its potential. Ukraine and Japan have the basis for building a sound and profound partnership. The two countries should capitalize on their shared experiences with nuclear power accidents and Russian annexation of territories by working on global joint preventive measures in the former and stronger norms in the latter case. Japan’s ODA projects and investments prove Japan’s interest toward Ukraine. 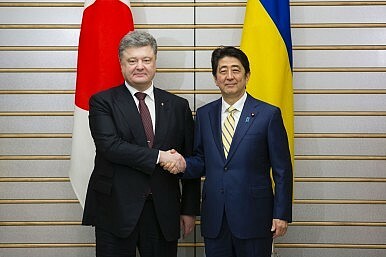 The implementation of the DCFTA with the EU makes Ukraine even more attractive to Japanese investors. Upon a successful realization of large ODA projects, including the modernization of the Bortnychi sewage systemand installing a steam turbine at Trypilska thermal power plant, we can expect a spill-over effect for other large infrastructure projects. Through ODA, the Japanese companies can use business opportunities and enter Ukraine’s market. Since Ukraine will be reaping most of the benefits, it must spearhead the construction of strategic relations with Japan on a consistent basis, without fluctuations between high-level visits. Poroshenko has announced that 2017 will be the year of Japan in Ukraine. It is an ideal opportunity to develop and put into practice small and concrete steps towards a grand strategic cooperation with Japan and to realize the relationship’s full potential. Olena Mykal is Assistant Professor in Political Science at National University Kyiv-Mohyla Academy. Her main areas of expertise are foreign policy of Ukraine, bilateral relations of Ukraine with East Asian countries. She received her PhD at Waseda University in Tokyo.